Beth Rezoski provides her clients with expert advice and the benefits of her years of experience in helping them achieve their real estate goals. She has been recognized with numerous awards, including the RLP Diamond Award for ranking in the top 3% in all of Canada. Beth is a long-time Real Estate Solution client, and we developed an earlier brand for her that was right for where she was in her career at that point. When she was ready to update her brand to match where her business is now, we created a new, modern brand for her. 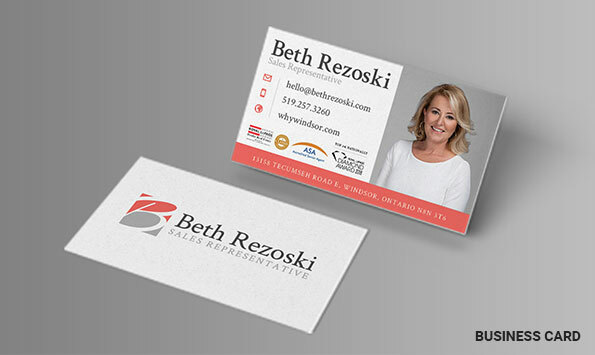 Beth’s real estate brand includes an elegant, distinct logo, business card and yard sign design and print, social media graphics, notepad design and print and more for her day-to-day use. We also designed and handled the print of specialty items including a branded property listing booklet that can be customized to her specific individual listings when she needs it. When Beth was ready for a new custom real estate website to replace her existing one, we sat down with her and consulted on the messages that were important to her, the image she wanted to present to her website visitors and the information she wanted to include. From there, we custom designed Beth’s Real Estate Solution website around her brand and included custom information about the community, how she can help her clients and her involvement in the local area. One of Beth’s areas of expertise is waterfront properties, and we also included a custom page on her website focused exclusively on the advantages of waterfront real estate in Windsor-Essex. This page includes details about the great value in the properties available, Beth’s experience in waterfront real estate and how she can help clients who are new to waterfront homes or coming to the area for the first time. As part of her lead generation services, we continue to work with Beth to help her reach more new clients and gain exposure for her real estate brand. With social media marketing, we promote new property listings and other messages on Facebook, while the support services we provide her with include new print and marketing designs as well as continued updates to the content on her website. 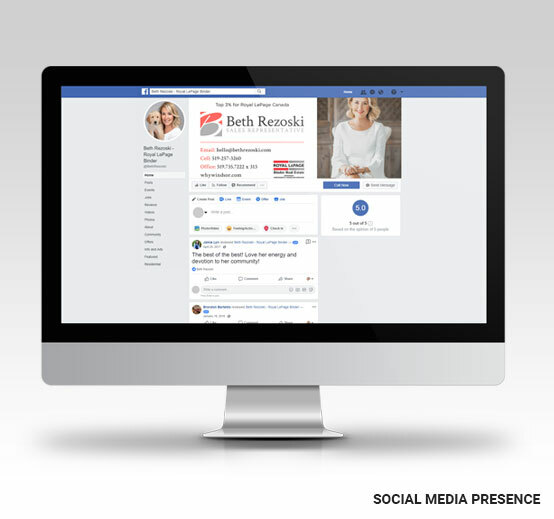 Beth is just one of the many real estate professionals we’ve helped to market themselves, build their online presence and grow their business. Whether you are an established agent looking to move to the next level or are just starting out in the real estate industry, we would love the chance to talk to you about how we can help you reach your goals. To find out more, fill out the form below or call us at 519-800-8010.